I have been wanting to make the above image for some time. The view is across the harbour from Chidham towards the village of Bosham with its instantly recognisable Church and spire reaching to the sky. I often return to this particular spot when out walking but to get the result I was looking for, the height of the tide had to be at a certain level. Too low and there is too much vegetation…..too high and the posts are disappearing into the water. I do have the ‘Tides Planner’ App for my iPhone which tells me the height of the tide, so today I headed out with time to spare to watch and wait as the tide started to come in. I had also been cotemplating that a long exposure would enhance the scene and this of course would require a tripod, ND filters etc. Not the sort of stuff I usually carry with me when out walking. I am normally a spontaneous photographer but this shot was planned and thought about in advance. Although a fairly bright day there was no direct sunlight which is exactly what I wanted. Too much contrast would have made life more difficult, so a little bit of good fortune was on my side. 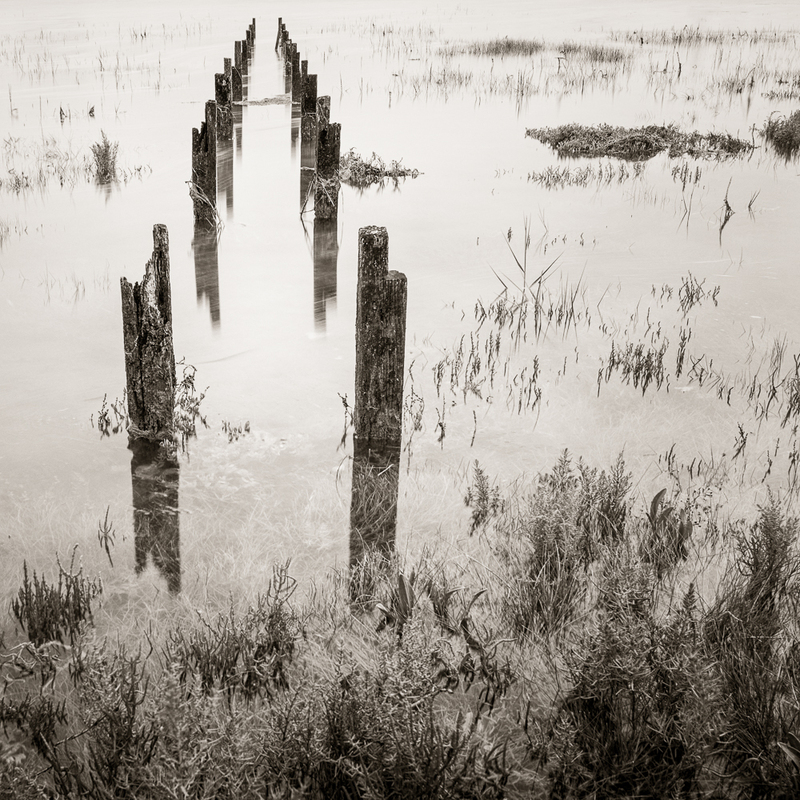 Welly boots on, tripod securely standing in the silt, camera set up with a 28mm lens, composition decided, hyper-focal distance set and after 12 seconds at f11, the image was exposed to the sensor. I checked the histogram which showed me no blown highlights and in truth a balanced tonal range. Ideal for post processing. I sometimes wait a few days or even longer before I process my images but on this occasion I couldn’t wait, so earlier this afternoon I sat down at my Mac, fired up Lightroom and overall I am pleased the result. Here is another image taken at the same time. I thought about placing the posts in the centre of the frame but I rather like the fact they are offset to the left and lie on ‘the rule of thirds’. Placing them in the centre was a little too obvious. 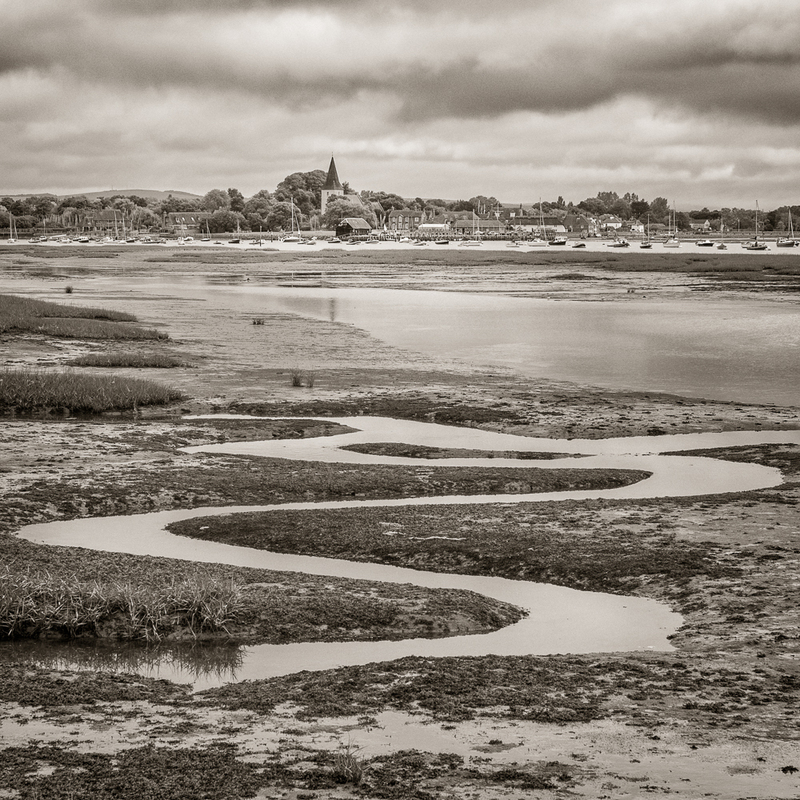 And lastly another image of Bosham taken yesterday from a different position on the shoreline. This time at low tide. All of these photographs are being added to my ‘Chichester Harbour’ project portfolio and when I get the time I will upload a gallery to this site. Do click on an image to view a larger version. Beautiful landscape compositions, your planning paid off! Thanks. I think it did, although I would still like to return on a misty morning when the village a church are slightly obscured. I think that might add another dimension to the shot. Interesting point, l’ve started paying more attention to humidity and dew point and it’s impact on landscapes and the general backgrounds in a composition. Especially as tot he degree of contrast falloff over distance. I love shooting in the mist or even light rain….it can be very beneficial to an image. Thanks very much for your kind and appreciate comment.